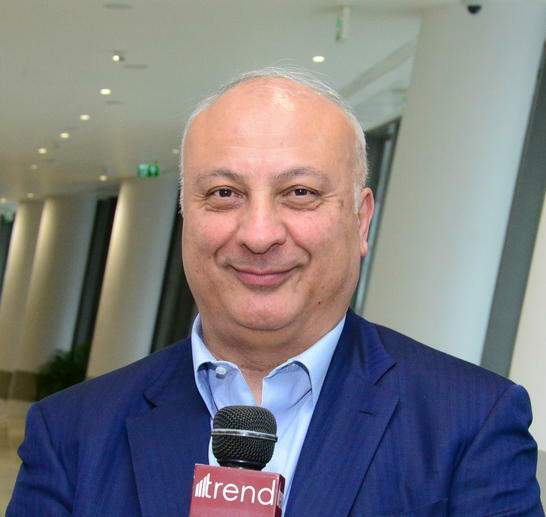 Azerbaijan Gymnastics Federation has done a great job and all this is because it has a good president, Vice-President of Azerbaijan Gymnastics Federation Altay Hasanov told reporters April 15. Under Mehriban Aliyeva’s leadership, it is impossible not to succeed and not to reach such heights, he said. Hasanov noted that the XXVI European Championships in Trampoline, Double Mini-Trampoline and Tumbling held in Baku is another important event in Azerbaijan’s sports life. “Baku is hosting such a significant tournament as the European Championship with participation of 25 countries and more than 400 gymnasts. You are aware that we have experience in holding tournaments of such level. Judging by the interviews of athletes and delegation members, which we read in our media outlets, they are satisfied with the preparation and organization level of the competitions. Secondly, as for the results, at this moment, we have fulfilled one of the main tasks set for our team. Our gymnasts got all the licenses for participation in 2019 European Games. So, the minimum task has been fulfilled. At the same time, we witnessed first-hand how our Mikhail Malkin from Baku, who had all stages of his preparation here in Baku, finally reached his peak and won the gold medal. It is very significant for Azerbaijan, for him and his coach and for the whole Federation. We also won a silver medal in synchronized trampoline. Our girls performed successfully. We believe that the European Championship has already been successful. We have practically fulfilled our task,” said Altay Hasanov. He noted that earlier, when the Federation was taking its first steps after the restructuring in 2002, the focus was on ensuring mass involvement in sports, involving regions and trying to learn from grandees of European gymnastics. “Now we can teach something as well. It is very pleasant that we ourselves apply such know-how in the organization. For example, the mascot invited from abroad performs successfully, inspires everyone, perfectly lifts mood and we for the first time applied this. It is the merit and creativity of the employees of our Federation and its leaders. It would certainly be boring without this. As a result, not only gymnasts and their parents, but also ordinary people were attracted to sports and to stands. This year tourists have also come to watch namely this tournament. We are accustomed that usually we go somewhere to watch sport competitions, but Baku is already turning into Europe’s sports center as well. This gladdens us. But it does not calm us down and makes us work even more and think about the future,” said Altay Hasanov. He said that Azerbaijan Gymnastics Federation is optimistic about the future. “Azerbaijan already has medals in gymnastics types which are untraditional for us. Trampoline has not been very developed in Azerbaijan until now. The 2015 European Games held in Baku gave a great impetus to this. The interest in gymnastics grew even more and the results became better,” said Altay Hasanov. He said that Baku will host several more large-scale tournaments this year. “There will be two tournaments in rhythmic gymnastics - junior and senior World Cups - this April. It is also planned to hold qualifications for Youth Olympic Games. World Cup in Acrobatic Gymnastics will for the first time be held in Baku. Moreover, the Congress of the International Gymnastics Federation will be held in December. All these are significant events. Next year there will be World Rhythmic Gymnastics Championship. This is the most beautiful type of gymnastics and competition here is high,” said Altay Hasanov. He noted that there is a change of generations in Azerbaijan Gymnastics Federation, new people always come and the life is very interesting and busy here. “Sometimes, it may seem that federations have been created to help the ministry of sports, but federations, in particular, the Gymnastics Federation carries out great work. Azerbaijan Gymnastics Federation has done a great job and all this is because it has a good president. It is impossible not to succeed and not to reach such heights under Mehriban Aliyeva’s leadership. Moreover, we have a very good team in the Federation, recruited by the current UEG President Farid Gayibov. He works actively in his new position. I read In Gayibov’s interview, he wants to develop gymnastics in Europe. I believe that he will work both for them and for us. It is a great event for the sports life of our society that the Azerbaijani, the person who started as an ordinary manager in the Federation, became the president of the sports federation in Europe,” Altay Hasanov concluded.